This is one of the most common mistakes made by nail technicians. Whether you’re applying acrylic nails or gel nails, proper curing is a must. If you don’t do that, there’s a high chance of infection. The most common mistake is of adding more monomer to the acrylic nail mixture and not curing the gel nails under the UV or LED lights well. These applications should be done by experienced and well-trained professionals instead of amateurs. If the gel nail isn’t cured well, there’s a risk of infection to both the client and your technician. You can avoid this by keep a strict eye on the procedure from time to time. There are several technicians that get very nervous about signs of infection and ignore it. That’s not a good way to react. 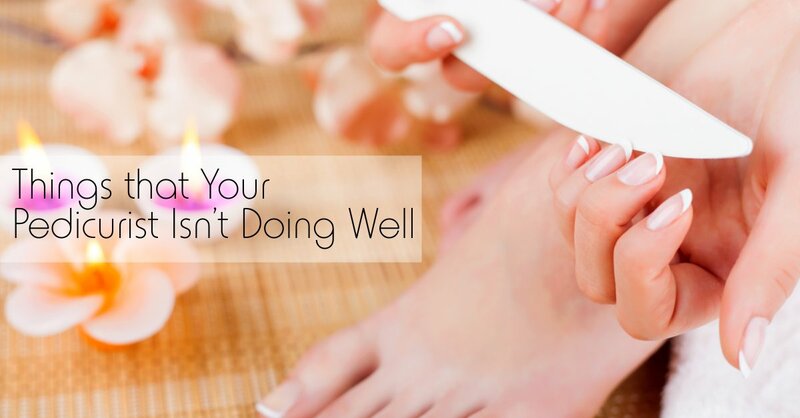 If the client complains about pain and soreness in their toe, don’t ignore it. You should inspect the toe carefully to make sure that there is an infection or if there’s some other problem. If you think it’s something that should be addressed immediately, ask the client to book an appointment with a podiatrist as soon as possible. That way the client can address the problem before it becomes too serious. If you ignore it or assure the client it’s not a serious problem when it is, you’ll risk your client’s health. The callus remover will remove the callus, but not in its entirety. In fact, it’ll only soften the skin on the callus so that it can be pressed and smoothed down. That’s what its purpose is. Don’t use the remover to remove the entire callus because that would expose the skin underneath it. That can lead to infections. You should carefully read the instructions before you use the product. Most removers are supposed to be applied directly on the callus and not on any areas surrounding it. They’re also supposed to be left on for only a limited period of time. If the instructions say that it should be left on the callus for only 10 minutes, don’t leave it on for 15 assuming that it’ll be more effective. It doesn’t really work that way. Causing the clients discomfort is the last thing you’re supposed to do so you shouldn’t use any force during the pedicure and manicure. Take the gel nail polish for example. If the gel is allow to stay on the nail for too long, it’s very difficult to remove. If you find that it’s not coming off even after slightly longer in the nail remover, don’t try to scrub it off. Using force and scrubbing the nails would only damage the nails. This can also lead to infection. To avoid this, you should encourage clients to come on a regular basis. This would ensure that the gel polish doesn’t stay on the nails for too long and is easier to remove. Products come with instructions for a reason. The manufactures understand how their products work and know how to achieve the best results from them. There are some technicians that think that they know better and experiment with nail coats, with curing times, with product use, etc. This can lead to disastrous results. You should keep an eye on your salon technicians to ensure that they don’t make such mistakes. If you have any questions about manicure and pedicure, pedicure chairs, and equipment, you’re free to contact us at Pedi Source. Just give us a call at 1855 429 PEDI. You can also email one of these two email address with your questions and contact details: [email protected] and [email protected].